Last weekend, Justin Trudeau was elected leader of the Canadian Federal Liberal Party. 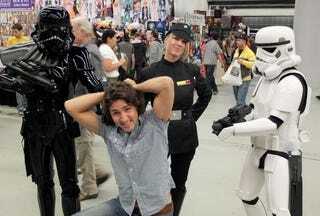 Here's a picture of him clowning around with members of the 501st at last year's Montreal Comic Con. This wasn't him stumping or anything, he just took his kids out to the Con. Still, seemed kind of noteworthy for nerds and geeks.